» Botany Photo of the Day » 2017 » October » Phragmidium sp. There’s something visually appealing about the striking contrast of bright orange fungi on lush green leaves in the spring. For example, here is rose rust (Phragmidium sp.) covering the leaves of a Nootka rose (Rosa nutkana), photographed on one of British Columbia’s Gulf Islands. Phragmidium spp. are pathogenic fungi in the Phragmidiaceae, a family of rust fungi. Rose rusts are widespread throughout North America and Europe, most commonly occurring in mild and moist climates such as the Pacific coast. I took this photo on (Mandarte Island), where the temperate conditions are ideal for the development of the rust. Rose rust presence typically subsides in the summer with drier weather, as this one did. The genus Phragmidium contains a number of species of rose rust, most easily distinguished by their host species. …it infects the host tissues for extended periods without killing them, feeding on the living cells. Like all rusts, it is not able to survive on dead plant material, so must either alternate with a different, perennial host, or produce a resting spore to pass the dormant season. 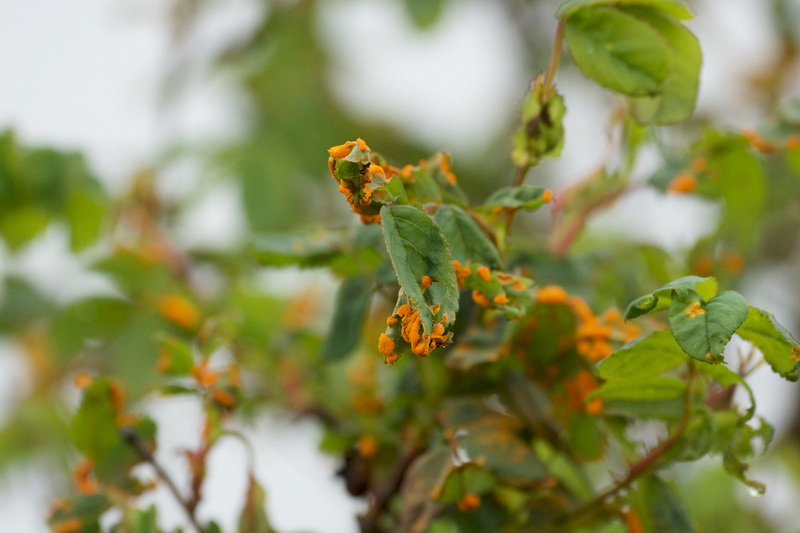 Rose rust is among the less serious of common rose diseases. It rarely causes damage worthy of urgent control measures. Effective treatments include pruning and burning of infected parts. In milder climates where leaves may not fully drop over the winter, removal of dead leaves is also recommended. Actually, no. I couldn’t help but cringe the instant I saw this photo. But, that has more to do with knowing what I was looking at and what it meant to the rose. immediately thought about what to use for control measures ….. Such an interesting name: Phragmidium. Is it a reference to how pragmatic the fungus is, in not killing the rose it feeds from? It is from scientific Latin phragma from ancient Greek ϕραγματ-, ϕράγμα fence, screen, plus -idium (a diminutive suffix) from Latin from Greek ἴδιον.